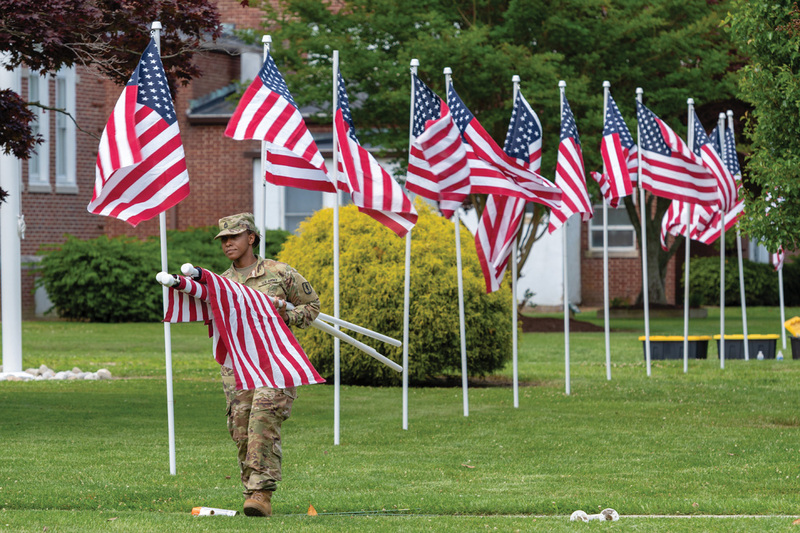 Members of the National Guard set up flags at Lord Baltimore Elementary School for this weekend’s ceremony. This Monday marks Memorial Day, a day to honor Americans who fell while serving their country in the armed services. To commemorate their ultimate sacrifice, the Southern Sussex Rotary will be holding a ceremony on Saturday, May 26, at 1 p.m. on the lawn of Lord Baltimore Elementary School in Ocean View. “I just think it’s a great opportunity to start Memorial Day weekend off with honoring people that have served,” said Rotarian Christine McCoy, a past president of the group, which started the local event in 2015. “At the time, also, it was when a lot of police attacks started, so we wanted to include first-responders, so we could include our police officers and anyone who goes out and protects us on a daily basis and puts their lives on the line for us. Surrounded by waving flags of red, white and blue that have been sponsored with donations honoring those who have served, local politicians, including state Sen. Gerald Hocker, Rep. Ron Gray and County Councilman Rob Arlett will be reading the names of the heroes whom the flags represent. “Words can’t express how honored we are to do it,” said incoming Southern Sussex Rotary President Scott Smith, who is also retired from the U.S. Army. “When I was active duty, we did Memorial Day, we did the honor guard — but this is a very special time for me, with honoring the fallen, memorializing the folks who have fought ahead of me and will fight behind me. Those who attend this year will also hear from Brig. Gen. Kenneth “Ed” Brandt of the U.S. Army National Guard. The Indian River High School band ensemble and the JROTC will also be in attendance. The ceremony is open to all, and the Southern Sussex Rotarians are hoping to draw even more interest from the community than in the prior three years of the event. 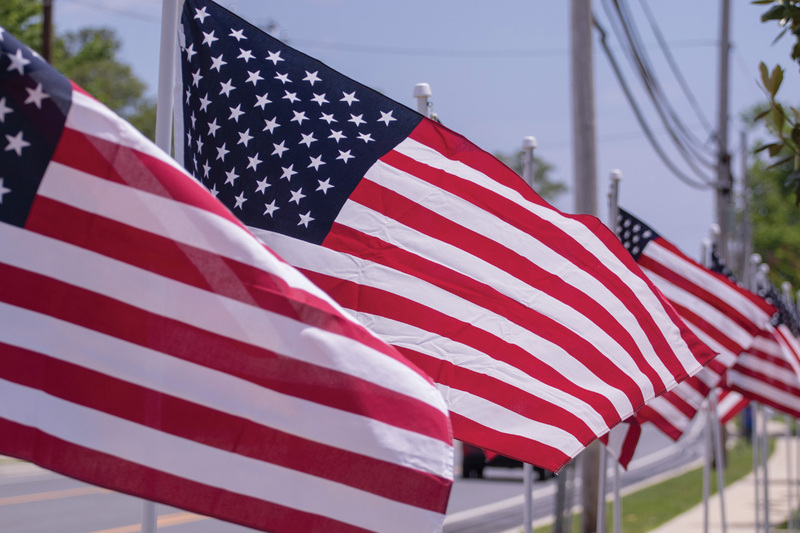 Along with the flags at L.B., flags will also be flying at Mountaire in Selbyville and Blades HVAC in Dagsboro, all of which the two local National Guard units helped place. “I just think it raises awareness of what the weekend is about and reminds people to honor those who are serving,” said McCoy of the fundraiser. “It’s personal, because I still honor the brothers and sisters that still continue to fight, the ones before me and the ones after. It’s important to me because I love my country,” Smith added. Each flag represents an individual its sponsor wishes to honor as a hero. “It’s been very well received. We’ve asked for flag sponsors, and we have corporate sponsors and individual sponsors. People have hunted us down, trying to find a way to get involved and sponsor flags,” said McCoy. 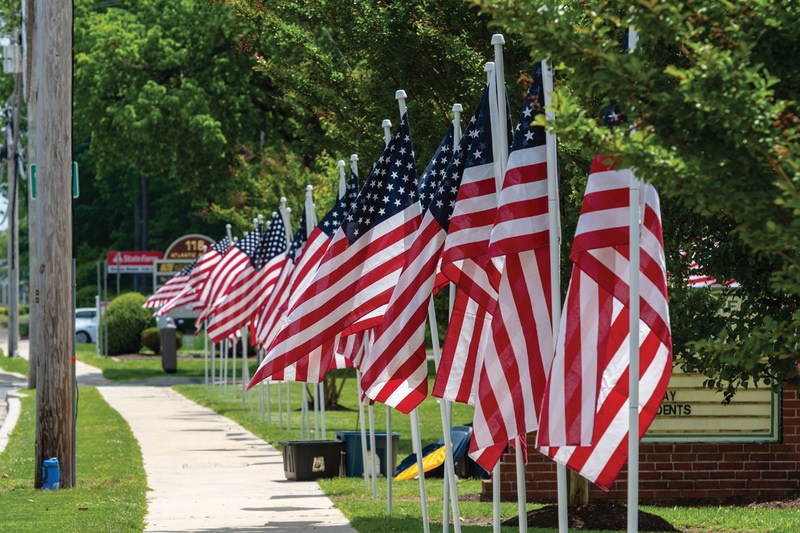 Last year, 200 flags were sponsored and more than $8,000 was raised in honor of veterans, current service members and local first-responders. Proceeds were donated to the Dagsboro Botanical Gardens, to honor Rotarian Ferdinand Comolli, to Operation Seas the Day, to Easter Seals’ Camp Fairlee, to the Delaware National Guard and to Rotary’s “End Polio Now” campaign. In 2018, the funds raised will support a Milton family through Operation Finally Home, a national, non-profit organization dedicated to building homes for wounded, ill or injured veterans, and their families. Those who attend Saturday’s event may also learn how to get involved in Flags for Heroes next year. The organization also sponsors the Selbyville Christmas Parade and does a great deal of outreach in schools. “We’re very focused on the school system as well. We do a lot for the high school. We do dictionaries and a spelling bee for third-graders. We have an ‘Interact Club’ at the high school now,” said McCoy. The club meets every Thursday morning at 7:30 a.m. at Brandywine Assisted Living in West Fenwick, and currently has 16 active members. “We’re always looking for professionals, active or retired, to join our club. We’re little, but we’re mighty,” she said. McCoy said she joined the Rotary Club because she felt a need to serve her community. She said she hopes others will feel moved to do the same and join their team. Lord Baltimore Elementary School is located at 120 Atlantic Avenue in Ocean View. To learn more about the Southern Sussex Rotary Club, visit southernsussexrotary.org or https://www.facebook.com/SouthernSussexRotary.